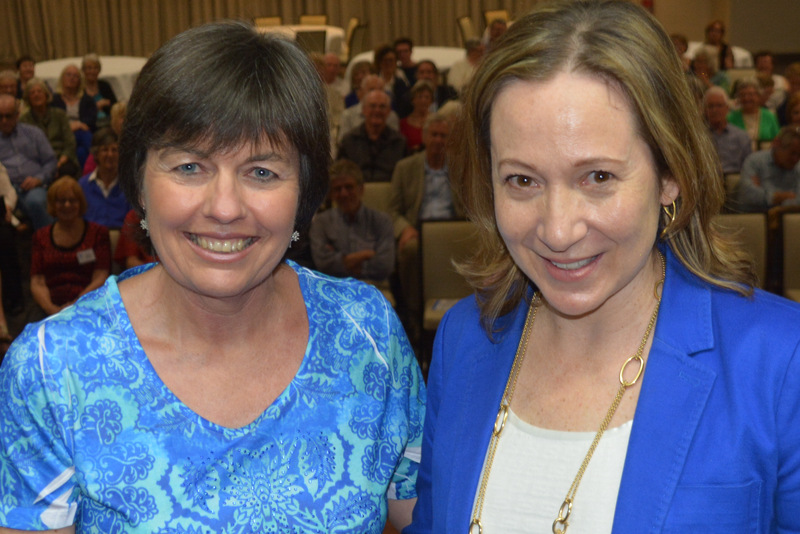 Here’s a partial transcript of my One Plus One style interview with ABC TV’s Jane Hutcheon, with a couple of amateur quality videos embedded to give you the flavour of what was a most entertaining evening. Jane Hutcheon, welcome to Armidale’s version of One Plus One! You went from being a foreign correspondent to being the host of an interview show. As a foreign correspondent, you were chasing stories about war, disaster, political conflict – things that affect masses of people. Then you switched to a job where you’re sitting down with one person and having a very intimate conversation about their life. Did it feel like a radical change? Or not really? Not at all, because as a correspondent I was sitting down with people having little one plus ones in their house for four, five hours, sometimes longer, just to understand their stories. And then I would interview them and you might see 30 seconds of them, or if you were lucky and watching Foreign Correspondent you might see a 20 or 30 minute story. That was always the bread and butter of my job, was to sit down and talk to people and really – this is so kind of overused, this phrase – but to walk in their shoes, to feel what it was like to live in a place that bombs were whizzing over, or to live in an Israeli settlement or live in Gaza. That was my job, to go and find out what life was like for those people. And I wasn’t the one who came up with the idea of the interview program. That was my boss, Gaven Morris, who’s now the director of ABC News, and he was the one who actually said to me, why don’t you do an interview program. I remember thinking at the time – why would I do an interview program? I didn’t really click to the idea immediately. But then when I sat down and started talking to people I thought, this is just an extension of what I’ve always done. Right, so no new skillset required? Oh no, most certainly a new skillset. I think as an on-the-road journalist, and as you can see from a lot of our political interviewers, they need to get a more precise answer. They don’t have half an hour to sit down and have a chat. I think the whole process of getting a short news clip or an answer where you need someone to say something very succinctly, is very different to trying to encourage someone to unfold their story. Whereas they might not be so keen when they sit down to tell you all of those things. So it is a different skillset. You can’t scare them off, particularly at the first hurdle. I think you have to demonstrate that you have invested in them – you’ve read everything you can about what they’ve done, you’ve watched their shows, maybe read every profile that’s been written of them. You have to demonstrate you have this connection because you have spent hours and hours looking at their lives and careers. You have to. Homework is very important most of the time. But sometimes there is not much time available. If someone offers you a big interview and says its tomorrow at 9 o’clock, and its 5pm the day before, well, you just read whatever you can, do whatever you can in the remaining hours. You can’t say no. And, I believe you do all your own research. You don’t have a team of people digging up facts for you and writing your questions? That’s right. One Plus One is a very small team. Its literally produced by two people, and we have an editor, and we have a wonderful camera crew. It’s a very small team, and also I found in the early days, with the first producer I had we tried to split up the research, so she would say I’ll do this one and this one and you can do these two. And I would come to the interview with her questions, and I saw the interview in a completely different way. So we decided that in order for me to have that connection, it had to be me doing the research, I couldn’t have someone read the book and give me notes about it. Because the things that she would pick up wouldn’t be the same as what I would pick up. So I’m very proud to say I do all my own research. I wish I had someone I could have a bit of a back and forth with so I made sure I could get all the questions exactly right – we don’t have that luxury. So I write the questions, I write the flow of the interview, and do all the reading, which is actually extremely pleasurable. You come from a family of journalists. Your eldest brother writes for the Sydney Morning Herald, your father was the editor of the South China Morning Post, and your mother was a senior reporter there. In your book you said journalism lets you indulge your ‘insatiable curiosity about the way people live, fight, survive, die, create and destroy’. But why are you the black sheep of the family – why have you gone in for television rather than print? Ah, that’s a very good question. I loved the medium of pictures, moving pictures, ever since I started to study journalism at Charles Sturt University. There was something magical to me about telling a story in pictures. And I suppose too I wanted to stamp out a different territory from newspapers as that’s where my dad in particular had been. It’s always been just a complete love affair. I tried radio, I had to do radio in most of my postings, and there’s an intimacy in radio but its always been about TV for me. I can’t really explain why. I actually wondered – because I saw that you had a great love of drama, and that was something that attracted you to the course at Bathurst – I wondered if you just liked presenting words in person instead of words on the page? Oh gee, that’s deep. I did enjoy drama but I don’t know that work as a TV journalist and enjoying drama – maybe there is some segue in that you have to present and in a sense you have to be a bit larger than life on occasions. But its always been about intimacy for me. I do love all of those wonderful interviews we have at the ABC, fantastic radio interviews. But I love to see the expressions on people’s faces. And incredibly, whenever I look back at the interviews – so for example, today’s interview was with Tim Cahill, the Socceroo, the legendary Australian football player and I haven’t seen it yet because I was travelling – as soon as I see that interview I will see about ten things that I did not pick up when we were sitting opposite each other. Sometimes they can be really minute things, sometimes you can actually see a bit of disturbance in people’s faces. You can notice nerves which you absolutely didn’t notice when they were sitting in front of you. So I think there is something magical about the lens, and I know a lot of people who work in TV say that. It picks up things that perhaps us talking here together might not pick up ourselves. One Plus One began a year or so after Andrew Denton’s Enough Rope finished, and you’ve said you’re a big fan of his. I wonder, do you think he’s had an influence on your work? Denton has been back in the public eye recently with his assisted dying cause. Will you have him on the program? I have asked him before, to be honest, and he has not agreed. He’s not keen to be on the other side..? No. I do know him personally, so I understand where he’s coming from. I could try and ask him again, I might do that. I respect it if people say no. There’s usually a good reason. He is quite a private person and I usually do ask a lot more than just about his current work and his career, so he’s got to be up for that. He’s actually said that he’s “an introvert trapped in an extrovert’s career”. He has some good lines. Someone who spent many years interviewing prominent older Americans, called Marc Pachter, said in a TED talk that it’s important to get through the ‘infomercials’ that people trot out about themselves, especially celebrities. He thinks if the interviewer has enough empathy and can ask the right questions, it allows people to be truthful about who they are, and how they became that way. Do you agree with that version of things – do you think it’s part of your job to break through the cocoon of the public self and reveal the person within? I always aim to do that. It’s not always possible, for a variety of reasons. The other thing is that unlike a lot of interview programs where they film and film, we don’t do that. We try to make our interviews as organic as possible. We normally film for 30-40 minutes and they’re edited to time. I think if you accept that you are going to be able to break through in some areas but perhaps not all areas then perhaps it’s up to another interview, or another interviewer, to get other parts of that person. I don’t think you can have the definitive interview. Certainly I don’t look at it in that way. I look at these interviews as moments in time. Sometimes you can cut through the public persona. You know, the public persona is just protection. People form narratives of themselves because it’s safe. That way they don’t have to talk about things that are painful, they don’t have to talk about failure if they don’t want to. I love talking about failure but not everyone does. I wonder what you think about when you’re deciding what should be your first question… Are you looking for something that your guest can relax into and answer quite easily, or are you looking for a fresh and interesting angle given that they’ve probably spoken a fair bit before to other interviewers? Or is it a bit of both, or something else? It’s a great question, because the first question is the hardest. So how I normally structure my interviews is chronologically but sometimes I’ll move things around depending on where in the narrative we come in. then I try to think of an opening question that either completely relaxes, stuns or transports them. I’m just thinking off the top of my head. It’s got to be something that is like a giant door opening.